Sunday before the beginning of a new school year. Little kid and his mom, walking toward the local bus stop. Little kid's gonna start kindergarten tomorrow. Mom has to work, so she's showing him where to catch the bus. "See?," she says. "It's easy. Just down the block, around the corner, and stop here where the curb is red, beneath this blue triangular sign." The sign says, "Bus," in white letters on a light blue background. Little kid, of course, can't read yet; so Mom is teaching him to recognize the corner by color and shape. "Now," she says. "There's just one thing. Two kinds of busses stop here. The city busses are blue, and new, and kindof square-shaped. You don't want those. 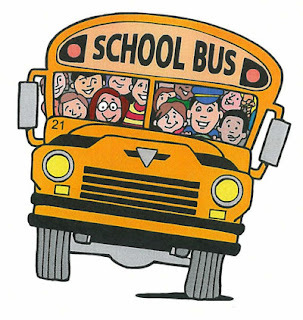 The school busses are yellow, and old, and kindof round-shaped; and they say, 'School Bus' above the front windows." She thinks for a second. "OK. I know you can't read. I'm sure you'll recognize the school buses, but, I want you to be extra-careful. 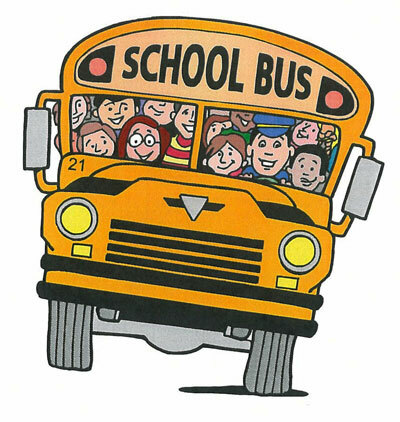 When the bus stops, and the doors open, I want you to ask the driver, 'Does this bus go to school?' Just to be sure. Got it?" He nods. Piece of cake. Can't wait. Almost bursting with excitement. New friends! Learning! Maybe soon he'll be able to read! All that night he tosses and turns, hoping for it to be morning soon. Morning arrives at last. Mom's already gone. He makes cereal for breakfast, dresses himself in his new school clothes. He's got new blue trousers, a new red jacket, a new red cap, and a new Batman lunchpail. His heart's beating fast, he's so excited. He locks the door behind him, trots down the block, around the corner, and stops right where Mom showed him, at the red curb beneath the blue triangular sign. He recognizes the bus easily. Just like Mom said, it's yellow, old, and kindof round-shaped. There are letters above the front windows which he's pretty certain must spell "School Bus." But he does what Mom instructed him to do. When the bus stops, and the doors open, he looks up into the driver's eyes and excitedly asks, "Doth dis buz gowta skoooo?" The driver slams the doors in his face and drives off, in a cloud of diesel exhaust. Little kid is shocked, and confused. He's sure that was the right bus. Did he do something wrong? He waits, spirits sinking, while several city busses stop and leave. They're easy to recognize, just as Mom said: blue, new, kindof square-shaped. There are no more yellow, old, round busses. Around lunchtime he returns sadly home. After work, Mom wants to know how his exciting first day went. She's saddened for him by his story. He's so disappointed. And she's puzzled: it all sounds right. Right corner, right blue triangular sign, right yellow, old, roundish bus which probably said "School Bus" above the front windows. She thinks, and explains, "There must have been some first-day mix-up. Some bureaucratic thing. New drivers, maybe. 'Cause I'm sure everything you did was right." She shrugs, and hugs him. "I'm sure everything will be fine for you tomorrow." Little kid again has trouble sleeping, but this time it's as much from apprehension as excitement. He wants to go, but, he's not sure what went wrong. In the morning he fixes cereal, dresses himself in his blue trousers, red jacket, red cap, and Batman lunchpail, locks the door behind him. Trots down the block, around the corner, stops in the same place, at the red curb beneath the blue triangular sign. The same bus as yesterday arrives. It's yellow, old, and kindof round-shaped. There are letters above the front windows which likely spell "School Bus." With his heart pounding from anxiety, this time, he again does what Mom instructed him to do. The bus stops, the doors open, he looks into the driver's eyes and asks, "Doth dis buz gowta skoooo?" The driver slams the doors in his face a second time, and drives off, in a cloud of diesel exhaust. Wearily and in defeat, little kid returns home, waits for mom. "How'd it go?," she asks. Same story. She's puzzled, and alarmed, and more than a little angry at the driver. Everything little kid says sounds exactly right. "But here's the deal," she tells him. "This is a joke, and, in jokes, things have to happen three times before you arrive at the punchline. So, I want you to do everything the same way tomorrow. If that fails, I'll take Thursday off work and come with you." This joke is not that funny, he thinks. Not when you have to live inside it. He sleeps badly, this time from fear. In the morning, fixes cereal, dresses in his new clothes, takes his Batman lunchpail, locks the door. Down the block, around the corner, here comes the yellow, old, round-shaped bus. "Doth dis buz gowta skoooo?" The driver slams the doors in his face. Cloud of diesel exhaust. "Alright, that's enough," Mom says in the evening when she arrives home from work. "This joke isn't funny anymore. I'm going with you and we're having a talk with that driver." Neither of them sleep well. Breakfast, clothes, lunchpail. This time they both walk down the block, and around the corner, to the red curb beneath the blue triangular sign. "This is where you've been going?," Mom asks. Little kid nods. "Well -- this is right," she says. "This is the place. I can read. The sign says, 'Bus'." She points up the street to the yellow, old, round-shaped bus now arriving. "Is that the bus that's been coming here?," she asks. Little kid nods. "Well -- this really is right," she says. "I can read, and those letters above the front windows clearly spell 'School Bus'." The doors open. Mom's good and angry. "Now listen you," she berates the driver. "My son's been here three mornings in a row, and three times you've refused to let him on your bus. He's been traumatized, he's going to have to start the school year late. And I can read: I know this is the right bus. Why aren't you letting him on?" The driver looks down from his driver's chair and says, with hurt feelings, "'Cauth he'z mekin funameeee." Moral of Story : Mom's and Dad's, please spend your time to be with your kids in the first day of their journey begin.